A biomedical promotion plan budgeted at NT$10.94 billion (US$346.32 million) for next year was approved Nov. 10 by the Executive Yuan as part of government efforts to further advance President Tsai Ing-wen’s five-plus-two innovative industries initiative and transform Taiwan into a center of biotechnology and medical R&D in Asia. Hsu Kuo-yung, spokesman of the Executive Yuan, said as the undertaking calls for wide-ranging cooperation among government ministries and agencies, Premier Lin Chuan has directed all related parties to jointly draft an action plan for its implementation. Overseen by the Ministry of Science and Technology, the plan involves enhancing areas like human resources, finances and intellectual property. A key undertaking is drafting legislation on foreign investment, overseas talent recruitment, tax breaks and easing restrictions on the development and production of experimental medical devices and pharmaceuticals. Other objectives include establishing a north-south biomedical corridor linking the main campuses of Taiwan’s three science parks in Hsinchu, Taichung and Tainan cities so as to enhance their research capabilities; tapping the international health care market, particularly in countries covered by the New Southbound Policy; and developing precision medicine, specialized clinics and health-related peripheral industries. 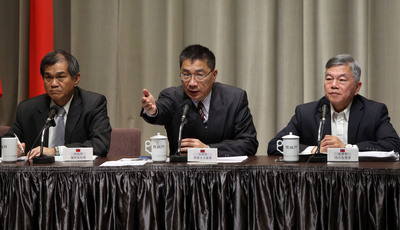 Shen Jong-chin, deputy minister of economic affairs, said the Executive Yuan has passed an amendment to the Act for the Development of Biotech and New Pharmaceuticals Industry. Once approved by the Legislative Yuan before year-end, the bill will help augment the production value and competitiveness of biotechnology through encouraging investment in new technologies for preventative and regenerative medicine products, he added. According to Tsai, the plan features contingencies for boosting tie-ups with major biomedical R&D hubs in U.S. cities like Boston, San Diego and San Francisco, as well as leading European drug developers. This measure is expected to keep Taiwan abreast of the latest biotechnological advances worldwide and grow its footprint in the lucrative medical care segments for seniors and ethnic Chinese, he said. The five-plus-two innovative industries initiative is at the vanguard of government efforts to revitalize Taiwan’s economy. It targets the five emerging and high-growth sectors of biotech and pharmaceuticals, green energy, national defense, smart machinery and Internet of Things, as well as focuses on promotion of two core concepts: circular economy and a new paradigm for agricultural development.